Gaming has come a long way since the original NES, but nothing beats crushing your favorite games on a retro controller. 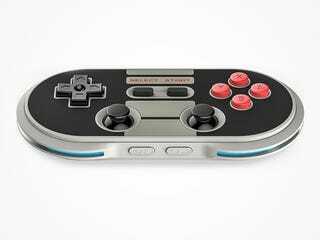 8Bitdo’s NES30 Pro Bluetooth Controller lets you play the latest games on an old school, NES-inspired controller. It normally costs $50, but Kotaku readers can grab one for over 25% off - just $36.99 with free worldwide shipping. Works with 3rd-party game platforms like Baidu, KO Gaming City, etc. Finally, you can connect with your favorite console or computer to play any modern or old school game with this retro, NES-inspired controller. It’s compatible with nearly any Bluetooth or USB capable device, and can be configured to work like a PC joystick, Bluetooth keyboard, or Wii remote. For just $36.99, you’ll get the NES30 Pro controller, an NES-style USB cable, and even an NES 30th anniversary keychain. Free worldwide shipping is included, and should take 1-2 weeks to arrive. Interested? Hit the link below to grab yours.